Chinese Internet censorship targets social media again! China censorship targets social media again! Internet censorship in China keeps on increasing, targeting once more social media! The administration in charge of Internet regulation in China has reported that media can no longer use any information found on social media, without being authorized by the government. This is a new stage in censorship taken by the Chinese government, so as to increasingly control both internet and the media. As Chinese President Xi Jinping explained in December 2015: “To enable Internet freedom, censorship is necessary.” And this measure is not the last that has been announced by the Cyberspace Administration of China (CAC), the authority which regulates Internet. Since July 4th, the Chinese media are thus now banned to use any information from social networks, without being allowed to do so by Beijing. “It is forbidden to use hearsay to create information or to use conjecture and imagination to distort the facts,” said the regulator, according to the South China Morning Post. Indeed, if a journalist wants to use a testimony or any data posted by some web user on social media, he/she will first need to ask the express agreement of the Government. If the latter refuses and the journalist still wants to publish the information, then the media may be also banned. As a reminder, Facebook, Google and Youtube are banned in China, since 2009. The CAC announcing this also indicates tightened controls on the internet: “All branches of the Internet regulatory body should seriously investigate and deal with any false information, and those that did not prove to be real facts “. The CAC also said that several Chinese news portals have already been sanctioned for not having correctly controlled sources, according to this authority. These “false information” can expose their authors to substantial penalties that may even go up to three years if the data is viewed more than 5,000 times. The government aims at fighting a “campaign against misinformation and rumors” but also said to fight terrorism. Unfortunately, these arguments are regularly used by China to justify the repression of so called troublesome Internet users according to the executive. But what worries most is that China is now trying to have these measures set in the law, trying to make them legitimate. Last week, it was Android smartphone users who were targeted. Also app developers have to monitor users’ activity but also to store their activity log for at least 60 days. By using a VPN, you’ll be able to hide your IP address and thus keep your private browsing, to bypass any surveillance or hacking attempt. So you can access all the social media you want, without limits! 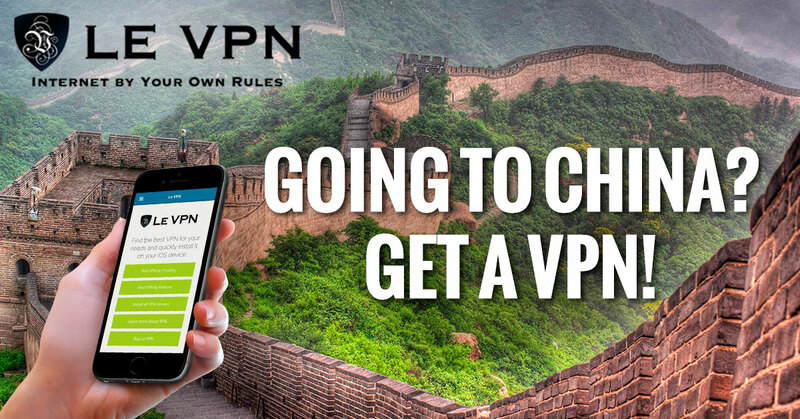 No log is kept by Le VPN, your navigation is thus fully anonymous and secure!